The jet stream that circles Earth's north pole travels west to east. 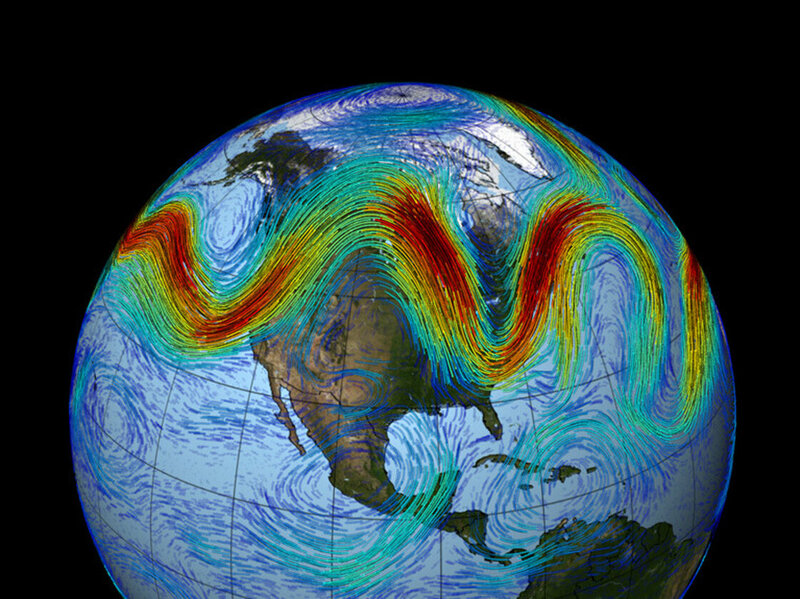 But when the jet stream interacts with a Rossby wave, as shown here, the winds can wander far north and south, bringing frigid air to normally mild southern states. Mark Twain once said: "If you don't like the weather in New England now, just wait a few minutes." He was making an unknowing reference to the jet stream, which drives the weather over North America and Europe like a high-altitude conveyor belt. 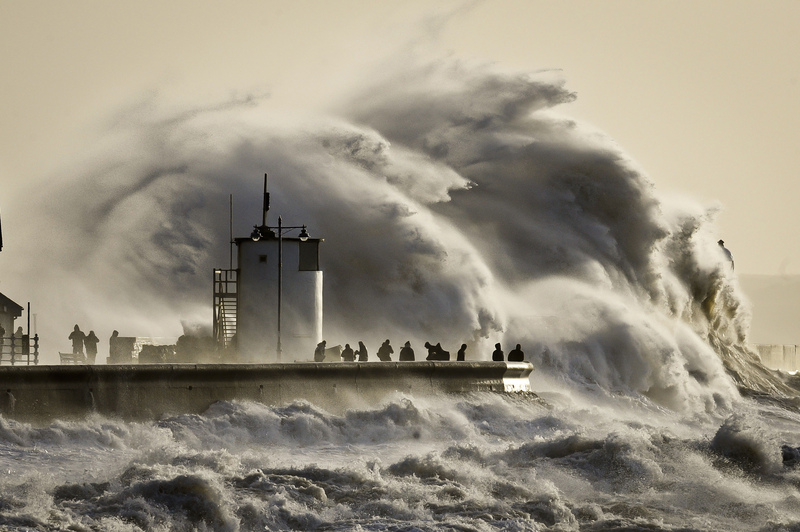 in early January as storms batter Britain. But increasingly, the jet stream is taking a more circuitous route over the northern latitudes, meaning weather systems hang around longer than they used to. And a warming Arctic is probably to blame, says Jennifer Francis, a professor at Rutgers University's Institute of Marine and Coastal Sciences. Francis — who says it's too early to know if the well-established Arctic warming is caused by man or some natural phenomenon — was speaking during a session on Arctic change at the annual meeting of the American Association for the Advancement of Science in Chicago on Saturday. The wayward jet stream could account for the persistently severe winter weather this year in the U.S. and Britain, as well as California's long drought. In all of the talk recently about the "polar vortex," you've already heard some of this. "The strength of the jet stream is directly proportional to the difference in temperature between the poles and the tropics. When it's strong, the jet stream tends to take a straighter path, but when it's weak it meanders. As the Arctic is experiencing warming at faster rates than the tropics, that difference is getting smaller, so the jet stream is weakening along with it. "What that means for mid-latitudes, where Britain [and the U.S. are] located, is weather that stays in place for longer. Weather patterns will be more likely to get 'stuck' over a location, yielding long periods of rain and sun rather than Britain's traditional 'changeable' skies." Snow cover in the eastern U.S. on Jan. 22. "The temperature difference between the Arctic and lower latitudes is one of the main sources of fuel for the jet stream; it's what drives the winds. And because the Arctic is warming so fast, that temperature difference is getting smaller, and so the fuel for the jet stream is getting weaker," Francis says. " When it gets into this pattern, those big waves tend to stay in the same place for some time. The pattern we've seen in December and January has been one of these very wavy patterns. "It doesn't mean that every year the U.K. is going to be in a stormy pattern," she adds. "Next year you could have very dry conditions, and for that to be persistent. You can't say that flooding is going to happen more often. Next year may be dry, but whatever you get is going to last longer." Mark Serreze, the director of the U.S. National Snow and Ice Data Center, was on the panel along with Francis. He says the idea that changes in the polar north could influence mid-latitude weather, was a new and lively area of research. "Fundamentally, the strong warming that might drive this is tied in with the loss of sea-ice cover that we're seeing, because the sea-ice cover acts as this lid that separates the ocean from a colder atmosphere," Serreze says. "If we remove that lid, we pump all this heat up into the atmosphere. That is a good part of the signal of warming that we're now seeing, and that could be driving some of these changes."